This Linux desktop environment is thin and fast with an overall elegance that makes it easy to figure out how to do things. For several reasons (including curiosity), a few weeks ago I started using Xfce as my Linux desktop. One reason was trouble with background daemons eating up all the CPU and I/O bandwidth on my very powerful main workstation. Of course, some of the instability may be due to my removal of some of the RPM packages that provide those background daemons. However, even before I removed the RPMs, the fact is KDE was unstable and causing performance and stability issues. I needed to use a different desktop to avoid these problems. I realized in looking back over my series of articles on Linux desktops that I had neglected Xfce. This article is intended to rectify that oversight. I like Xfce a lot and am enjoying the speed and lightness of it more than I thought I would. As part of my research, I googled to try to learn what Xfce means. There is a historical reference to XForms Common Environment, but Xfce no longer uses the XForms tools. Some years ago, I found a reference to "Xtra fine computing environment," and I like that a lot. I will use that (despite not being able to find the page reference again). Xfce has a very small memory footprint and CPU usage compared to some other desktops, such as KDE and GNOME. On my system, the programs that make up the Xfce desktop take a tiny amount of memory for such a powerful desktop. Very low CPU usage is also a hallmark of the Xfce desktop. With such a small memory footprint, I am not especially surprised that Xfce is also very sparing of CPU cycles. The Xfce desktop is simple and uncluttered with fluff. The basic desktop has two panels and a vertical line of icons on the left side. Panel 0 is at the bottom and consists of some basic application launchers, as well as the Applications icon, which provides access to all the applications on the system. Panel 1 is at the top and has an Applications launcher as well as a Workspace Switcher that allows the user to switch between multiple workspaces. The panels can be modified with additional items, such as new launchers, or by altering their height and width. The icons down the left side of the desktop consist of the Home directory and Trash icons. It can also display icons for the complete filesystem directory tree and any connected pluggable USB storage devices. These icons can be used to mount and unmount the device, as well as to open the default file manager. They can also be hidden if you prefer, and the Filesystem, Trash, and Home directory icons are separately controllable. The removable drives can be hidden or displayed as a group. Thunar, Xfce's default file manager, is simple, easy to use and configure, and very easy to learn. While not as fancy as file managers like Konqueror or Dolphin, it is quite capable and very fast. Thunar can't create multiple panes in its window, but it does provide tabs so multiple directories can be open at the same time. Thunar also has a very nice sidebar that, like the desktop, shows the same icons for the complete filesystem directory tree and any connected USB storage devices. Devices can be mounted and unmounted, and removable media such as CDs can be ejected. Thunar can also use helper applications such as Ark to open archive files when they are clicked. Archives, such as ZIP, TAR, and RPM files, can be viewed, and individual files can be copied out of them. 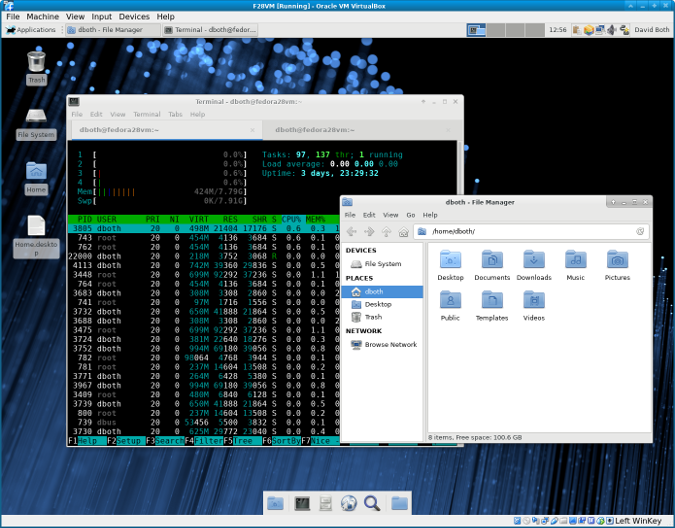 The Xfce desktop with Thunar and the Xfce terminal emulator. Having used many different applications for my series on file managers, I must say that I like Thunar for its simplicity and ease of use. It is easy to navigate the filesystem using the sidebar. The Xfce desktop is very stable. New releases seem to be on a three-year cycle, although updates are provided as necessary. The current version is 4.12, which was released in February 2015. The rock-solid nature of the Xfce desktop is very reassuring after having issues with KDE. The Xfce desktop has never crashed for me, and it has never spawned daemons that gobbled up system resources. It just sits there and works—which is what I want. Xfce is simply elegant. In my new book, The Linux Philosophy for SysAdmins, which will be available this fall, I talk about the many advantages of simplicity, including the fact that simplicity is one of the hallmarks of elegance. Clearly, the programmers who write and maintain Xfce and its component applications are great fans of simplicity. This simplicity is very likely the reason that Xfce is so stable, but it also results in a clean look, a responsive interface, an easily navigable structure that feels natural, and an overall elegance that makes it a pleasure to use. The Xfce4 terminal emulator is a powerful emulator that uses tabs to allow multiple terminals in a single window, like many other terminal emulators. This terminal emulator is simple compared to emulators like Tilix, Terminator, and Konsole, but it gets the job done. The tab names can be changed, and the tabs can be rearranged by drag and drop, using the arrow icons on the toolbar, or selecting the options on the menu bar. One thing I especially like about the tabs on the Xfce terminal emulator is that they display the name of the host to which they are connected regardless of how many other hosts are connected through to make that connection, e.g., host1==>host2==>host3==>host4 properly shows host4 in the tab. Other emulators show host2 at best. Other aspects of its function and appearance can be easily configured to suit your needs. Like other Xfce components, this terminal emulator uses very little in the way of system resources. Within its limits, Xfce is very configurable. While not offering as much configurability as a desktop like KDE, it is far more configurable (and more easily so) than GNOME, for example. I found that the Settings Manager is the doorway to everything needed to configure Xfce. The individual configuration apps are separately available, but the Settings Manager collects them all into one window for ease of access. All the important aspects of the desktop can be configured to meet my needs and preferences. Xfce has a number of individual projects that make up the whole, and not all parts of Xfce are necessarily installed by your distro. Xfce's projects page lists the main projects, so you can find additional parts you might want to install. The items that weren't installed on my Fedora 28 workstation when I installed the Xfce group were mostly the applications at the bottom of that page. There is also a documentation page, and a wiki called Xfce Goodies Project lists other Xfce-related projects that provide applications, artwork, and plugins for Thunar and the Xfce panels. I've learned that changing to a new Linux desktop can take some work to configure it as I want—with all of my favorite application launchers on the panel, my preferred wallpaper, and much more. I have changed to new desktops or updates of old ones many times over the years. It takes some time and a bit of patience. I think of it like when I've moved cubicles or offices at work. Someone carries my stuff from the old office to the new one, and I connect my computer, unpack the boxes, and place their contents in appropriate locations in my new office. Moving into the Xfce desktop was the easiest move I have ever made. Thanks for this article, David. Xfce is an old favourite - I used it with a number of lower-powered computers running lightweight Linux distros over the years. And I've even got my wife using it: her Manjaro-powered laptop used Xfce as its desktop environment and she loves it. Xfce cannot even keep up with gtk development.. if u see the project status its already deas. Support pantheon desktop environment and elementary os ecosystem. @Gayan Xfce development might be slow, but it is not "deas". You can look at the blog.xfce.org for it's latest updates, the last one (at the time of writing) was June 21st, a mere 4 days ago. The developers are working hard and well on their way to Xfce 4.14. The development builds are so far along that Manjaro is switching entirely to Xfce 4.13-dev ahead of the 4.14 Xfce release for Manjaro's 18th major version. I like, and keep going back to Xfce often. It's also one of my fallbacks in case anything goes wrong elsewhere. Like Linux is my fallback on any computer I get, Xfce is my fallback desktop environment if Gnome & KDE are a bit too heavy. I was surprised, though, that KDE actually uses about or less RAM on my systems than Xfce, though the CPU is more. Xfce is definitely lighter than Gnome and part of it I think is because Xfce doesn't include Evolution (and calendar et. al. components) or Online Accounts (which usually don't work for me). Xfce also doesn't include the integration like Gnome like clicking on the clock to get your calendar and notifications. I find the Xfce desktop to be more flexible and configurable than KDE, and a lot easier to customize! It harkens back to the days of Gnome 2 for ease and capability to customize the desktop. For example, trying to change the panel in Gnome or KDE to transparent for me so far requires downloading a theme, or extension, or roll up my sleeves and figure out the actual code. In Xfce it is right-click on panel > panel properties and in there you can select the color, opacity or image for the background. Gnome hasn't had it this easy since they left Gnome 2! I've even had Xfce set up for a while where there were NO panels. When the system was booted up (which is pretty quick regardless of the distro) all it showed was the wallpaper and that's it! Right- and Middle-click on the desktop brought up all the menus needed to open files, see everything that is open and on which desktop, etc. I also would keybind the keyboard's "Windows" and "Lists" keys to bring up the same 2 menus. Can't do this with any desktop environment I know of! First thing I do with Xfce, if it isn't included already, is to install the Whiskers Menu. Gayan, I'm pretty sure XFCE is still alive and well, although it does occasionally have lulls in development. It was ported to GTK3 a release or two ago. Perhaps you are confusing XFCE with LXDE which is somewhat retired in preference of LXQT. I'd recommend removing the standard applications menu and replacing it with the whisker menu which is offered as a separate package. On Fedora the package name is xfce4-whiskermenu-plugin but it may vary depending on which distro you use. Xubuntu uses the whisker menu by default. I believe there can be a search service for XFCE and search services (that crawl the filesystem and make a metadata database) can often be the CPU/RAM hogging thing on any desktop environment. If I ever find those going, I turn them off immediately AND remove the distro packages that provide the search function if doing so doesn't take out more than you want because of dependencies. I also use KDE Plasma on some systems and I haven't really had any issues with it... but granted I don't use all of the KDE applications (no kmail or PIM program usage) and I also turn off their file indexing / searching service. It is worth noting that you can also look at XFCE's startup services and disable any of them you don't want/use. They have a widget for that in their system settings area. I agree that XFCE is a lightweight and very nice looking DE. I like the way it is implemented in Linux MX 17.1 and Peppermint 9. For those who like elegance, small footprint, speed and functionality, please take a look at Bodhi Linux wither its Moksha DE (Enlightenment 17 fork). i’ve Been using it on daily basis for more than two years and have no complaints. Even though I use Bodhi daily, I keep closely watching Linux MX, Peppermint, and Solus. The major problem with both KDE and (especially) Gnome is that they insist in being the stars of the show - my way or the highway. They are in-your-face desktop environments, always reminding you that you can do things, as long as the KDE or Gnome developers think that that's the right thing to do. And, in order to do so, they are system resources hogs. To add to what the article says, Xfce just sits there, out of the way, waiting to do promptly and efficiently what you tell it to do, and when you tell it to do it. Most of of the time, you even forget it is there - and that is a very good thing. I've been using Xfce for many years on all my Linux systems, both large and small. I got completely sick of the gratuitous bloatware that GNOME and KDE have become over the years. And then GNOME 3 completely did away with my desktop, replacing it with something strange and confusing. For quite a long time, I went back to completely "old school" and used Fvwm as my window manager. Although a heavyweight WM back in the 90's, it's really lightweight by today's standards. I would still be using Fvwm today if not for the need to use USB flash drives. Unlike "normal" devices like SCSI and ATA hard drives, the device name for a USB device is not really predictable until after the device is inserted. To manually issue a "mount" command for a USB drive requires insane amounts of investigation in order to figure out what that device's name actually is. So I was forced to finally switch to a window manager with an integrated "desktop" that can respond to the UBS-insert dbus calls, displaying drive icons for my USB devices. After discovering that GNOME and KDE were even more bloated than they were when I last abandoned them, I looked for alternatives. I found LXDE to be a bit too minimal for me, but Xfce was almost perfect - I got the desktop I needed, a UI very close to classic GNOME, and a relatively lightweight footprint. You do not have to give up Fvwm. I use i3, tiling (dynamic) window manager myself. To mount USB drives and others, you can use a file manager that will do it for you, for example Thunar. You can also use an independent tool called udiskie. You probably have it in the repository. At least Debian has. It is also a good place to familiarize yourself with the features, see screenshots. KDE without Akonadi which is used for Kmail and Kontact, uses about 400 Mb on a fresh start up. Yes, maybe slightly more than Xfce4, but this depends on the programs your run by default. The stability is in my experience not so much a KDE problem as well the way the developers of the respectively distros implement the DE. I use Xfce4 as my fallback, and loving it. KDE is my main DE though. The more programs you run at the same time the more CPU and RAM is required. This is the same for both DEs. The Antergos implementation of Xfce4 and Plasma is stylish and very stable. No major problems with any of the two. I had a great time using Netrunner 17.06 (KDE based on Debian Testing) last year after I ditched Windows 7 (8 & 10+ are never getting on my systems). I kid you not...Netrunner consistenly used 390MB of RAM at startup. Yes, KDE Plasma! I was shocked too. Never had any problems with stability. But just a minor wart here & there which I attribute to KDE. If my laptop went to sleep and I woke it up, once in a little while (not too often), I'd enter my password but it won't let me back in. I'm betting it has something to do explicitly with KDE. I'd go look in the task manager and I'd see another plasma process (I forget the name of the daemon, but there's only supposed to be one running per session -- if I'm not mistaken). Just minor stuff like that but never an issue with anything else. Otherwise it was efficient and fast - just like Xfce - but looked really modern thanks to all the niceties that come with KDE Plasma. Right now, I'm running MX Linux so Xfce is my main desktop. No complaints! Fast, stable, predictable. Everything just works! But I would love to see them do an official KDE spin. I think it would make MX Linux even more popular. Now that my old favourite desktop (MATE) is now built with Gnome 3 components, I'm noticing that distros based on the latest MATE are heavier compared to Xfce. Could it be Gnome 3's dependence on systemd? At least MX Linux is systemd free. That's another reason why it is most likely so darn stable, light & reliable. I am a fan of Xfce, it's my go to window manager for my work machines. Good article and follow up discussion. Nice article! Xfce is my main DE when I don't have dwm running. Wow, nice! Xfce is really a good choice. Mainly i use MATE that is pretty awesome too. Nowadays i'm getting deep in Xfce too. In the company that a role digital biz we take 15 new laptops and the choice for production is Xubuntu lts. Its a newbie welcome distro and a think that is more stable than ubuntu. > Mainly i use MATE that is pretty awesome too. Is it just me, or is MATE getting bloaty after transitioning to GTK3+? MATE was at its best and most efficient when it was based on GTK2. Just to be sure about your comment on KDE "of some of the RPM packages that provide those background daemons. However, even before I removed the RPMs, the fact is KDE was unstable and causing performance and stability issues. ", what KDE version you were using KDE4 or KDE5 (Plasma)? KDE 5 Plasma. Latest updates seem to be improving it but I am not ready to go back to KDE. I like Xfce enough to stick with it for a while just because it works very well and I want to improve my knowledge of it. I love xfce4-terminal. The Drop Down mode is very useful.